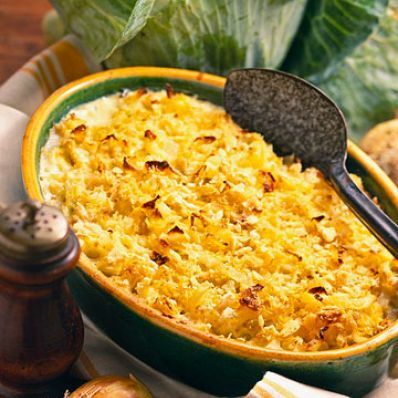 Cabbage and onion bake in an egg custard in this side-dish casserole recipe. Crushed crackers help thicken the mixture. 1 of 4 Heat oven to 325 degrees F. Butter 10-cup casserole dish. 2 of 4 Melt 1/2 cup butter in large pot. Add cabbage and onion; cook over medium heat until softened, about 20 minutes. Stir in milk; bring to boiling. Lower heat to medium-low; simmer for 5 minutes. Remove pot from heat. Let cool slightly. 3 of 4 Gently stir in eggs. Add 1/2 cup crushed crackers, salt and pepper. Pour into prepared casserole dish. Dust top evenly with remaining crushed crackers. 4 of 4 Bake in 325 degrees F oven for 30 minutes or until heated through and top is golden brown.